RF-SMART's Labor Management Reporting (LMR) provides seven purpose-built reports that give warehouse managers the ability to look at productivity, efficiency and ROI across the supply chain - and make better decisions based on that insight. 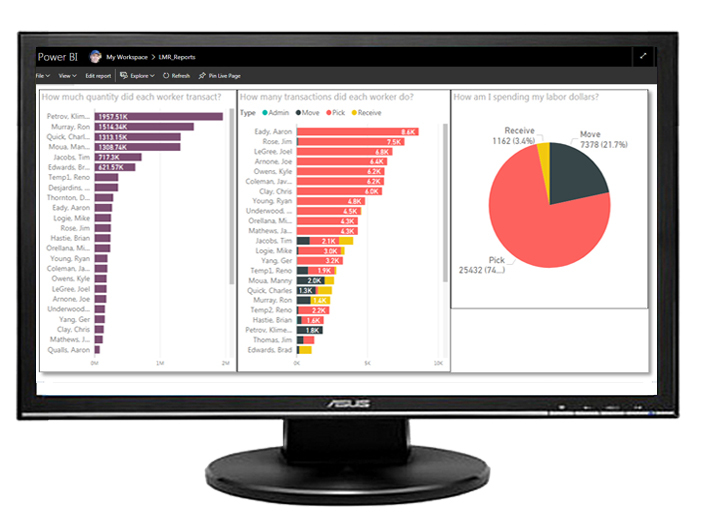 LMR uses transaction data from RF-SMART workflows and displays these reports with Microsoft’s Power BI. The updated UI makes for a better user experience, and the simple architecture makes for a faster install. You also gain the ability to create your own custom reports. What Makes up Labor Management Reporting? Transaction Count - How many transactions did each worker do? Quantity - How much quantity did each worker transact? Work Load Distribution - How evenly is the work distributed among workers? Transaction Cost Comparison - What transactions do I spend the most/least amount of money on? Worker Productivity - Who are my most efficient workers? Cost-Based Worker Productivity - Is my worker’s hourly rate justified (cost-weighted productivity)? Total Productive Time - How much productive time does each worker have? Interested in how Labor Management Reporting can improve your warehouse?